Scott Hampton repairs vintage tube mics, especially those needing new power supplies. His mic repairs involve replacing and updating selected components, fine-tuning the circuitry, and restoration of the mic's original sonic character. He can also furnish a Hamptone second-generation Tube Mic Power Supply. Bill Bradley restores vintage mics in Nashville, TN. The M221A had female threads on the microphone body. 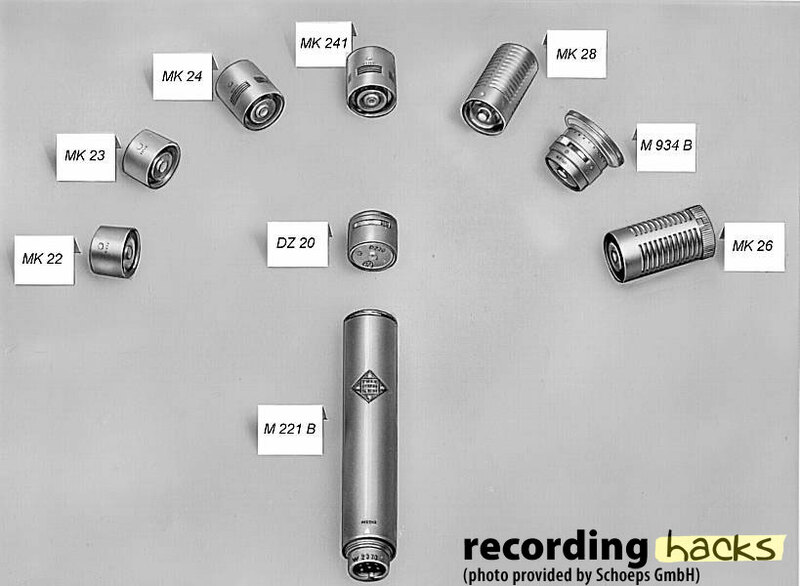 The M221B and all subsequent versions had male threads on the microphone body. The mic used a tube amplifier circuit based on the Telefunken AC701 subminiature triode. By means of a very effective feedback circuit, its working point is stabilized, and the [slightly] non-linear distortion factor of the amplifier is held down to the lowest frequencies of the range. The transformer-coupled output was set at the factory for either 200Ω output impedance (indicated by a blue dot on the microphone body), or 50Ω (indicated by a red dot). The 50-Ohm version has 6dB lower output. At least seven capsules were offered; we will add details of these as opportunities arise. The capsule polarization voltage in all cases was 120V, which is higher than used by the Schoeps “Colette” series of capsules (such as found on the CMC-5, CMC-6, and the M222 tube head-amp). 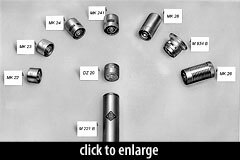 Therefore, although the capsule threading on the M 221 B is the same as on the Colette microphones, the contact terminals differ; capsules from the Colette series are not compatible with the M 221 B, even if some of the names are the same. This model was manufactured until 1985, and sold under a variety of names and logos, including Telefunken, Schoeps, and Siemens. The mic was released in 1956.